As omics technologies continue to migrate toward clinical applications, a market involving prognostic and predictive biomarkers is growing rapidly. This is an important space as it represents the segregation of biomarkers into classes based on their clinical utility. Biomarkers will be fundamental to the success of targeted therapeutics in the future. 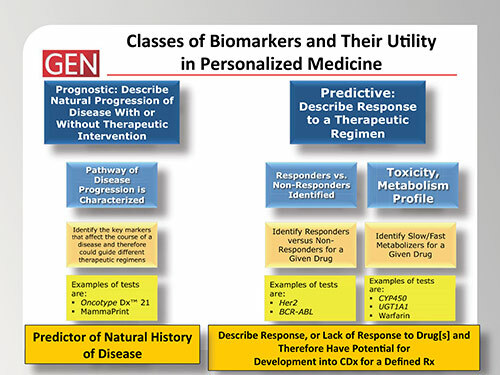 The implementation of personalized medicine in oncology and beyond requires a precise understanding of disease progression as well as molecular targeting of therapies to interrogate molecular lesions. Prognostic and predictive biomarkers have the power to affect these two functions, respectively. Indeed, many putative biomarkers have been postulated in the literature, but few have successfully been utilized in the clinic. If personalized medicine is to expand and scale across therapeutic classes, biomarkers must proliferate and find clinical utility.